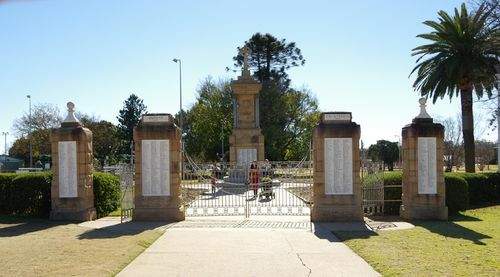 The gates contain marble tablets which list the names of all the men from Warwick who enlisted in World War One. Mr F Williams, the contractor for the Warwick War Memorial, has completed the stone for the gate pillars to the entrance of Leslie Park. In a few weeks the construction of the iron gates themselves will be completed, also the marble tablets. Following the commemoration service, Sir Littleton Groom unveiled the tablets containing 370 names of Warwick enlistments and officially opened the memorial gates on the pillars of which the names have been inscribed in marble. He handed the keys to the Mayor as a sacred trust on behalf of the citizens of Warwick and he expressed the hoped that when people passed through the gates they would bare their heads in recognition of the sacred associations with which they were "connected." The Mayor accepted the trust, which he regarded as a great responsibility, in a few well chosen words. The honour of first passing through the gates was accorded to the returned soldiers present. The squad followed by the memorial committee marched round the monument, saluting it in passing, to the strains of a march played by the Thistle Pipe Band. A vote of thanks to Sir Littleton Groom proposed by Mr.J. Anderson, chairman of the War Memorial Committee, and a verse of the National Anthem, concluded a memorable Anzac Day programme.